Belgium's Kim Clijsters wasted little time in flattening second seed Vera Zvonareva 6-3, 6-3 with an awesome display of power tennis to reach her second Australian Open final on Thursday. 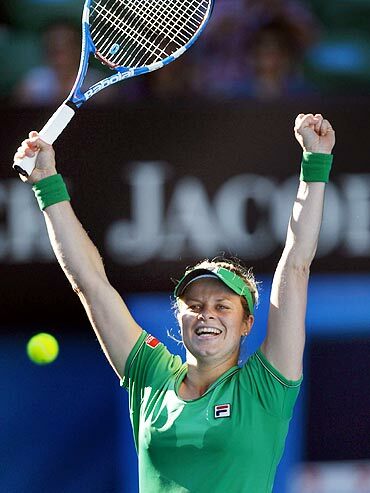 Third seed Clijsters, the 2004 Melbourne runner-up, will face Chinese ninth seed Li Na in Saturday's final after overpowering her Russian opponent in just 73 minutes. "I lifted my level compared to my other matches," Clijsters said in a courtside interview. "I've played in a lot of big matches and you learn from them. "I just keep fighting and try to be the last one standing." Clijsters, lime green dress and visor shimmering in the sunshine, simply had too many weapons for Zvonareva's comfort, the three-times grand slam champion taking the first set with a fierce drive volley. Zvonareva's big match temperament has been questioned in the past and her fragility showed on the key points, loose shots and fluffed volleys frequently letting her down. The second set followed a similar pattern, Clijsters chasing Zvonareva all over Rod Laver Arena and the former world number one completed an easy victory with a delicate drop volley. Clijsters, who also thrashed Zvonareva 6-2, 6-1 in last year's U.S. Open final, will replace the Russian as the world number two with her seventh win in their 10 meetings. Li Na hopes reaching the final of a grand slam for the first time at the Australian Open on Thursday will inspire a new generation of Chinese players to one day rival the number of Russians in women's tennis. The 28-year-old ninth seed will be the first Chinese to play for one of the sport's four major singles titles when she meets Kim Clijsters on Saturday after upsetting world number one Caroline Wozniacki 3-6, 7-5, 6-3. "I think maybe because right now I have got into the final, maybe many young players or children will see that and think, 'maybe one day we can do the same or even better than her? '," she said. "So some day they will feel more confident." International success also has a major impact on the development of sport in China, where the state-run system centrally distributes of funding and even athletes, and Li was hoping her breakthrough might influence the sports ministry. "(Officials), not in the China tennis federation but over the federation, maybe they are not so interested in tennis," she said. "But now, maybe they say, 'Oh, maybe we should be looking at tennis'. "So I think if we do better... more people will come to watch, more people will pay attention." Wuhan-born Li has been in the vanguard of Chinese women's tennis since being persuaded to return from a two years out of the game to play for her province at China's National Games. Shortly after returning to training, she won her country's first WTA tour title on home soil in Guangzhou and two years later was in the quarter-finals at Wimbledon. Caroline Wozniacki exits the Australian Open with her world number one ranking intact, but her semi-final surrender to China's Li Na will stand as another missed opportunity to silence her critics with grand slam success. The 20-year-old Dane dominated for the better part of two sets on Thursday, but crumbled when serving for the match to allow confidence player Li to grind out the win 3-6 7-5 6-3 at Rod Laver Arena. "I still had chances even after I lost that match point. I was serving, I had opportunities to go 6-6 (in the second set)," said a downcast Wozniacki, whose lone grand slam final ended with defeat to Belgian Kim Clijsters at the U.S. Open. "If you don't take your chances, yeah, you lose the match. That's what happened today. One ball could make a big difference. "I could have been sitting here as the winner. But could have, would have, if I would have done something different. "Right now, of course it's a bit disappointing. I just need to get through this one. I need to get back on the practice court and keep working hard and I'm sure I'll have more chances in the future." Wozniacki grew tired of media questions about her number one ranking and ran her own post-match news conference after reaching the fourth round. The ebullient Dane later concocted a tale about a kangaroo scratching, after worrying that media had thought her measured responses boring. On Thursday, the accusation was that her game was too boring, after failing to land a killer blow and then not lifting the aggression in the third set to match the feisty Chinese. "I don't know. I don't really think about that," Wozniacki said. "I was just trying to keep on going. "I was trying to take one ball at a time, and that's it. That wasn't enough today, so, you know, it's just bad luck. "I will come back. Just need to have an hour or two and I'll be back and on the right track again." 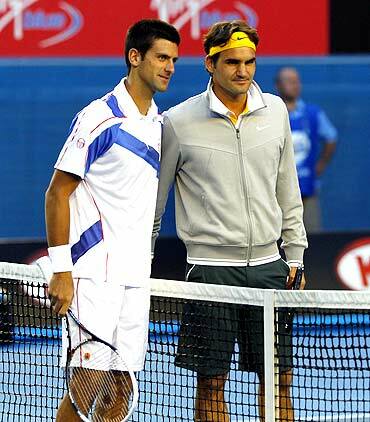 Novak Djokovic got the better of defending champion Roger Federer to get into the final of the Australian Open for a second time. The Serb, a champion at Melbourne in 2008, ended the Swiss player's hopes of a fifth title Down Under with a 7-6, 7-5, 6-4 win. The third seed didn't play at his best but was good enough for the second-seeded Federer, winning the contest in exactly three hours. Djokovic, who lost last year's US Open final to Rafael Nadal, will try to win his second major in his fourth final appearance on Sunday.